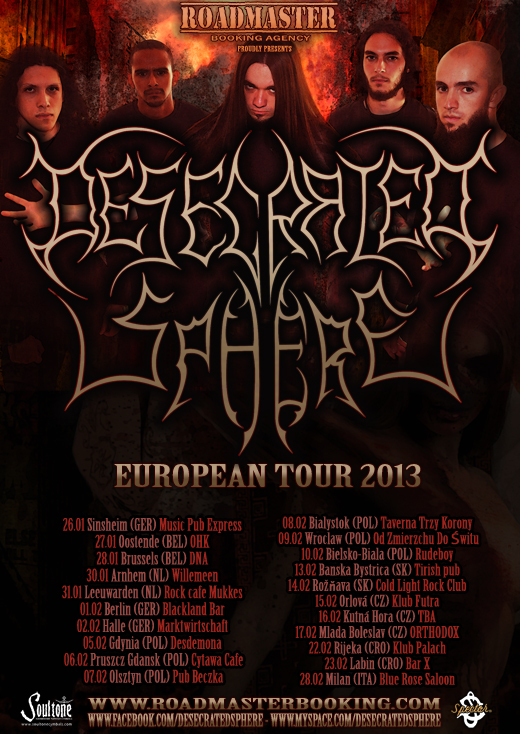 It is with immense pleasure that Roadmaster Booking comes to announce the dates of the European tour Desecrated SPHERE. The tour has shows scheduled in Germany, Belgium, the Netherlands, Poland, Slovakia, the Czech Republic, Croatia and Italy. “The expectations are the best possible. It is our first tour abroad, we´ will promote our first album and we start with 21 confirmed gigs. Having the perspective of showing our work to so many people in eight different countries is wonderful! The headbangers can expect intense and brutal shows that became a trademark of the band. We like a lot to interact with the audience and we can’t wait to put our feet on Europe’s stages and show our part of Brazilian Death Metal!”, says the bassist José “Motor” Mantovani.